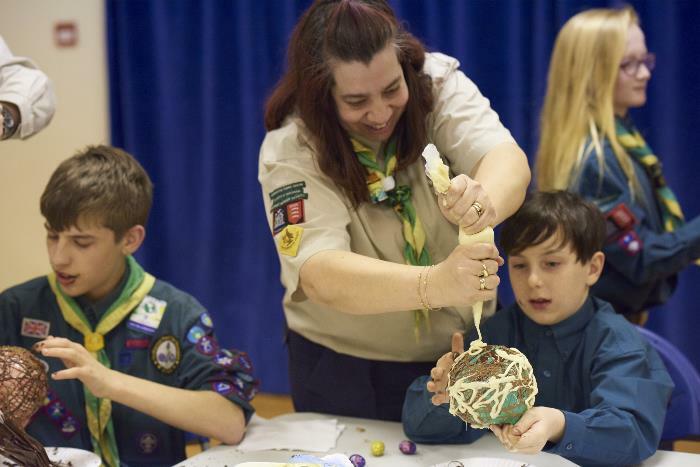 Scouting provides fun activities and adventures to young people, who are split into sections based on age. 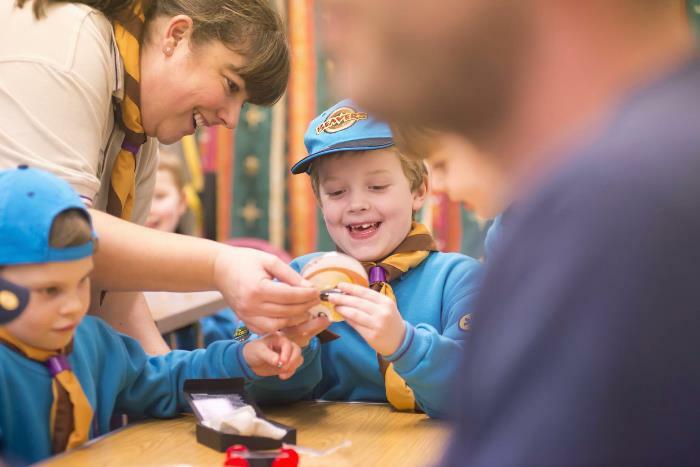 Beaver Scouts (6-8), Cub Scouts (8-10½), Scouts (10½-14), Explorer Scouts (14-18) and Scouts Network (18-25). 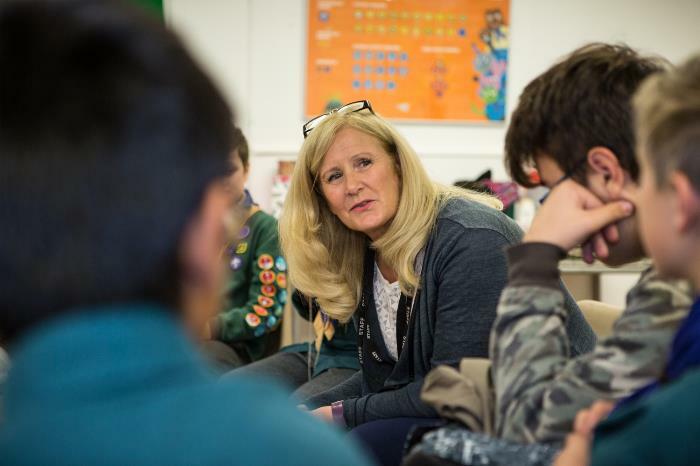 Volunteers are pivotal to the running of our Scout Group. These may include leaders, assistants, occasional helpers, parents, administrators, fundraisers and more. If you would like to hear more, use the Contact Us link on the left. Integrity We say what we mean and when we make a promise, we keep it. Respect We listen to others, explore our differences and work to find common ground. Care Scouts are friends to all and think of others before themselves. Belief We believe passionately in improving the lives and life chances of young people and helping them explore and develop their beliefs and attitudes. Cooperation Scouting is about teamwork. We believe that when we work together we achieve more than we can on our own. 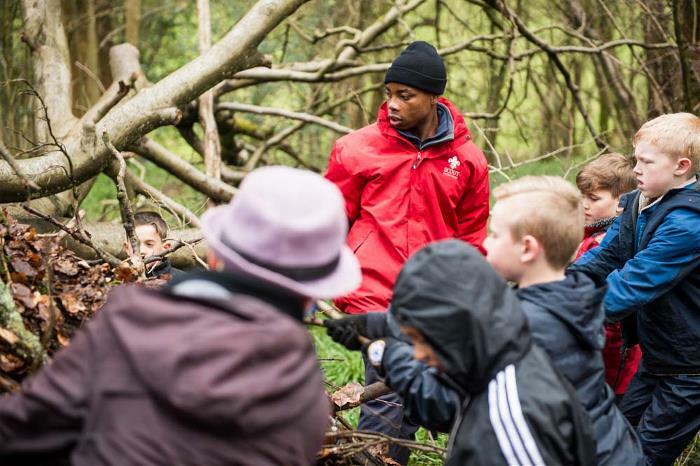 The Scouting Programme for all sections is based around three main themes: outdoor and adventure, world and skills. 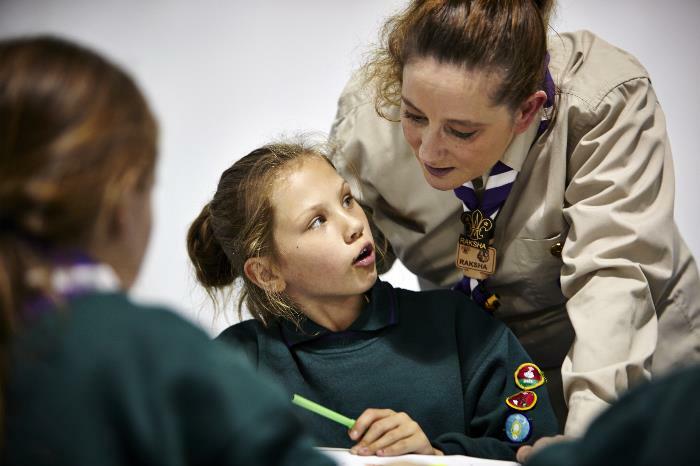 In each section a range of badges and awards support all aspects of Scouting, including the main themes: leadership, teamwork and personal development. The Programme is delivered in a balanced way that incorporates elements from each theme, to offer young people the most interesting and diverse experience. Our 10th annual Scout Black Tie Ball will be on 21st October this year. It's a great night out, with transport betwen Toddington and the venue for a small additional fee. You will get a glass of fizz and canapes on arrival, a three course meal, DJ, raffle and auction. The Ball is a key event in the calendar and so imporant to our fund raising. The group is always looking to raise money to support our activities, but a major reason is to help us repay money we borrowed to renovate our Scout Hut. Some of our newer members may not be aware that the hut was badly vandalised in 2014 and so we had to completly overhaul the hut, including landscaping the entire site, new flooring, fire doors, kitchen and full access toilet. We have secured further grants to help put in a storage shed at the back of the site which will allow us to bring some kit from the campsite up to the hut. Anything you can do to help us raise the funds to cover the costs of this great site is greatly appreciated. Coming to the ball with your nearest and dearest is the best way to do that and have a great night out at the same time! Details on the flyer. See you on the dancefloor! GUERNSEY - On Saturday 20th August, 17 Scouts and Explorers together with 8 Leaders set off from Toddington Village Green and headed for the small Channel Island of Guernsey. This is the sixth time this trip has taken place (we run it every two years). wallets out of tape and key rings out of paracord. The young people visited Castle Cornet on their re-enactment day, visited the German Underground Hospital and went on a walking tour of St Peter Port with Annette Henry, their 'Horrible Histories' guide. The Civil Protection invited us to take part in their bomb disposal training and five lucky young people got to detonate the bombs! They also went rib boating, go-karting, candle making, bread making (Guernsey gache), foraging and had a movie night. Their gache making exploits even featured in the local paper, The Guernsey Post. They built sand castles on the beach, flew kites, played football and some even swam in the sea. For some of the children it was their first time on Guernsey and for others the first trip on a propeller plane! Many of these activities present challenges to the young people and it's so great watching them conquer those challenges. The look of pride and delight on their faces makes it all worthwhile! EVENTS - Our Group continues to take part in fundraising activities to help with costs towards the ongoing refurbishment of our Scout Hut. 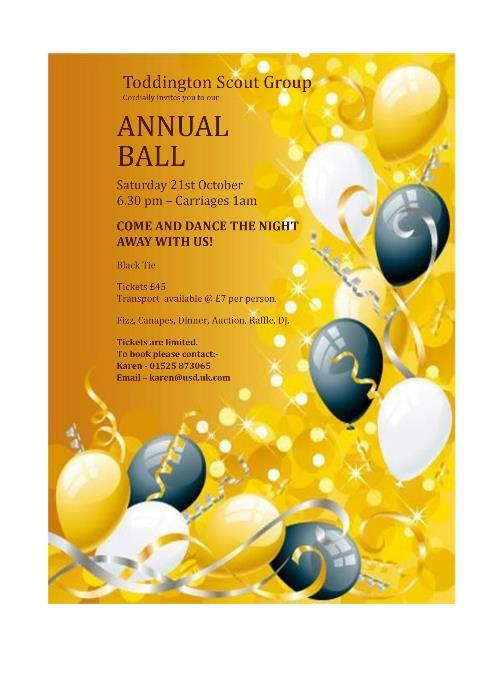 Our next event is our Annual Ball on Saturday 15th October. If you would like to join us for a great evening of food, drink & music in our beautiful indoor marquee at Houghton Regis Leisure Centre from 6.30pm to 1am, please contact Lynne Sherriffs on 07908 701109 or by email lynne.sherriffs@ntlworld.com to book your place NOW. Tickets remain at £45 per person, with transport available from local villages at £7 per person. We will be holding our Annual Firework Display on Saturday 5th of November at the Toddington Fire Station. Tickets purchased in advance include a Hotdog & Hot Chocolate. Tickets are £5 each and can be purchased from Toddington Library from Tues 18th October onwards. UPDATED AUGUST- Our Summer Lotto Bonus Ball Competition has finished and our ten lucky winners were as follows:- Maria Rawlings (no.30); Quizzy Peppers (team from our Quiz Night - no.3); Frances Pigott (no.47); Chris Bodsworth (no.16); Ali Waters (no.13); Zoe Evans (no.12); Liam Sherriffs (no.41); Rachel Harper (no.25); Frances Pigott (no.48) and Fiona Kraus (no.8). Congratulations to them and many thanks to all who entered. Our sections have been busy as usual, delivering action-packed programmes full of interesting activities and outings for our young people. 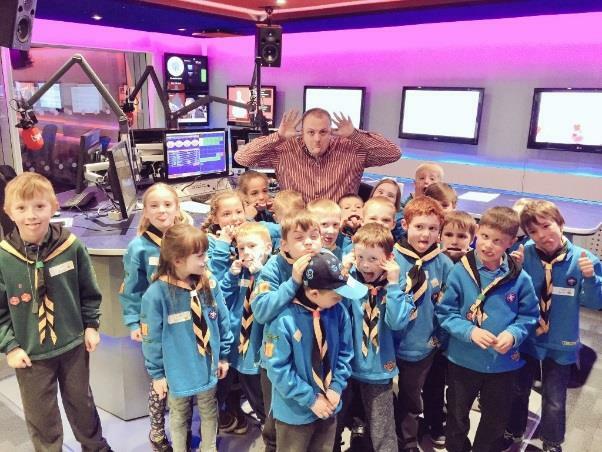 The Beavers recently went on a visit to Heart FM Radio Station in Milton Keynes. All the children (and their Beaver mascots, Woody & Buzz) had a great time. They particularly enjoyed the opportunity to record a message and say “Hello” live on-air with DJ Daniel Fox. Our Explorers recently went up to Bedford to the Observatory to see the sky at night and were fortunate to have a clear evening to make the most of their star-gazing. They’ve also had a visit from OSCAR, a vehicle used to promote road safety to young people in Central Bedfordshire. This visit focussed on drink driving, with a film displayed on the inside of the front windscreen of the car and the sound system and hydraulic suspension adding to the in-car simulator experience. Last month, were delighted to host our first social event in our Scout Hut since its refurbishment. We held a Quiz Night as part of the Toddington Spring Festival and an enjoyable evening was had by all. We will certainly host another Quiz Night in the future, so look out for that. We are currently updating our website, where you will find lots of useful information & contact details for all our Sections, along with details of any future events e.g our Annual Ball.